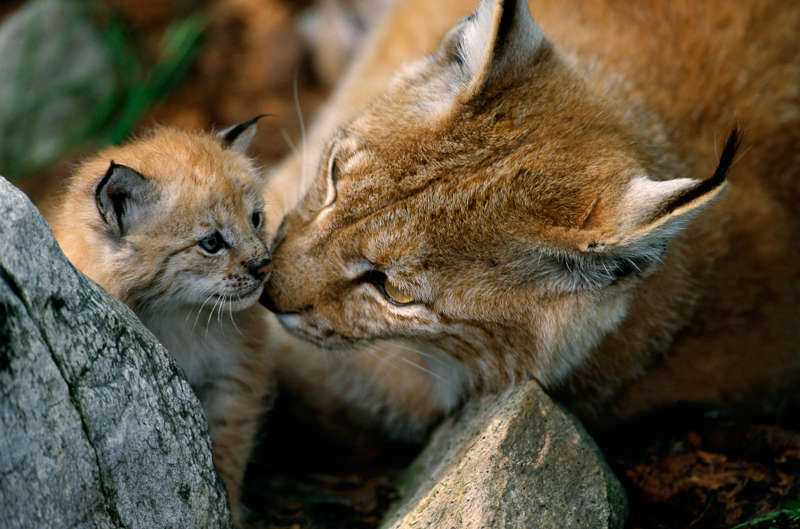 Eurasian Lynx female and kitten, Lynx lynx, Langedrag, Norway. Rewilding is a powerful new term in conservation. This may be because it combines a sense of passion and feeling for nature with advances in ecological science. The term resonates with diverse publics and seems to have a particular feel to a younger urban generation and among those who want a voice in shaping a new rural environment. It has attained a significant scientific, practical and media presence during the last few years. In late 2o15 and 2016, the authors of the ‘Policy Brief’ conducted interviews with experts in EU nature policy and legislation, in rewilding science and practice to explore opportunities to create a policy environment that would support fuller expression of emerging rewilding visions and examples. The result is a paper that describes rewilding and its key principles in the perspective of current and possible future relationships with EU politics, the Nature Directives, wilderness and ecosystem restoration. It also identifies existing and new policy frames and how rewilding can contribute to these, such as the Water Framework Directive, and a Trans-European Green Network (TEN-G). — Paul Jepson from the University of Oxford, explains: ‘’We need new concepts and innovation in policy for nature conservation to regain ground. Rewilding presents an opportunity to shift gear from protection to restoration, upgrading ecosystems, improving network connectivity and creating new value for people’’. — Frans Schepers, Managing Director of Rewilding Europe: ‘’There is huge potential in Europe for rewilding and large landscape restoration. Through this lens we can imagine a pan-European network of sites that capture the public imagination and ‘brand’ different regions of Europe, with a positive impact of creating a European identity’. 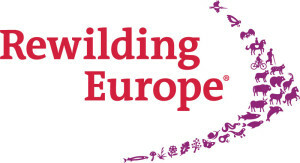 The Policy Brief presents the latest thinking on how rewilding is unfolding in a European context, and how it can contribute to the 15% restoration target that the EU committed to in the EU 2020 Biodiversity Strategy. The rise of the rewilding visions and practice across Europe coincides with the Fitness Check of the EU nature legislation. There is a strong and agreed view that the Nature Directives must be kept intact and that the focus should be on better implementation, where rewilding can play a significant role. 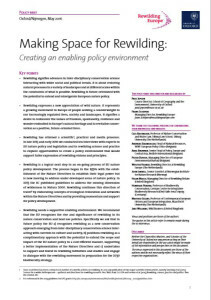 The Policy Brief includes a request to policy makers and proposes several ways to start with creating an enabling policy space for rewilding in Europe. You can download the Policy Brief here.